As Federal Reserve Chairman Ben Bernanke recalls in the video above (at 2:20), “I learned, basically, two lessons from my studies of the Depression.” The first was “that monetary policy needs to be supportive, not contractionary.” Interest rates are indeed low, but the Federal Reserve policies have failed to continue to expand the money supply. Notice the growth rates in the chart below. Apparently, the Fed’s low rates and money printing are just not enough to get the banking system lending. We explained the Fed’s powerlessness in this regard due to the collapse in the money multiplier last year. In layman’s terms, money is cheap but unless it circulates it becomes less plentiful. We mentioned the failure of the Creditanstalt last year. ”Like turning the page of a script before the movie catches up to you”; Europe’s 24 largest banks now need to raise roughly $980B over the next three years according to Citigroup. They will be in direct competition with European countries which also must raise $2Trillion this year alone. As we stated in November 2009, Greece is “probably the closest to default.” However from the Bloomberg chart below, it is Spain and Ireland that are even more important to European bank balance sheets. With European governments ‘crowding out’ private sector needs for capital and/or defaulting (causing massive losses at European banks), the risk is that a large European bank failure will generate another wave of financial crisis around the world such as happened in late 1930 and early 1931. Apparently, Mr. Bernanke fails to see the importance of his own second Great Depression lesson. When asked about the funding crisis in the European Union, he stated: “So we are keeping an eye on it but the Europeans, of course, it's most relevant to them. They're most exposed to those problems and they're very focused on trying to get them under control.” Fail. Instead of the excuses Ben Bernanke offers for the Federal Reserve during the Great Depression: “the Federal Reserve didn’t understand what was going on” or “they were pursuing very orthodox policies constrained by the gold standard”, investors should know that the market can render the central bank powerless. For instance, since 1999 Japan’s central bank has been purchasing financial assets with printed money to attempt to pump up their economy. But for ten years this quantitative easing policy has failed to lift Japan’s economy off the mat. Instead central banks’ power is derived from theatrics and sophistry. Note that half of the $1.4Trillion of commercial mortgages that are coming due over the next 4 years are underwater. If inflation-hedging investments were touted as ‘investing in the truthfulness of bankers’, we suspect a lot less would be sold on Wall Street. 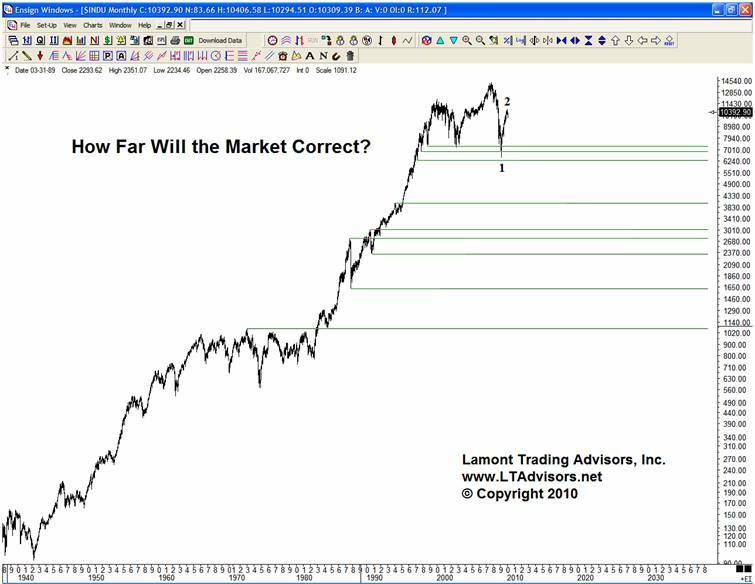 We expect the stock market to fall greater than 50% in our current leg down, a conservative forecast since the market fell roughly 85% in the third wave from 1930-1932. Only the highest quality bonds will continue to pay interest. Real estate will continue to fall and only the best cash will continue to preserve value. During the bounce of 2009 which we forecast, government aid supposedly prevented a Depression. Since even government credit is now being challenged all over the globe, its perceived support will be found insufficient. This realization will be shocking. 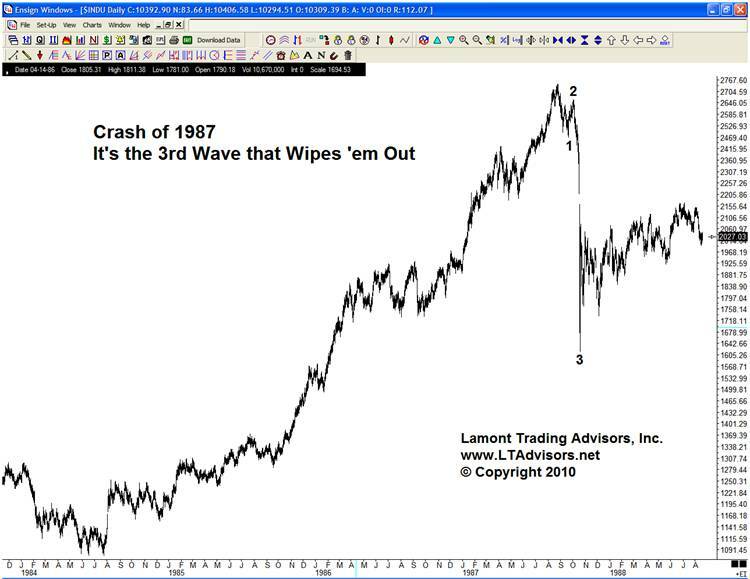 As the chart of the Crash of 1987 below demonstrates, the 3rd wave of a market decline is usually the most distinct. With the development of the Certificate of Indebtedness, a Treasury Direct Account has become a more attractive place to hold funds. Since we are very concerned with another round of financial institution failures, it’s always good to have a backup plan to your current institution. Therefore, we recommend opening a Treasury Direct Account, so that if your financial institution undergoes a run, you can transfer your cash to the Treasury for holding. At Lamont Trading Advisors, we provide wealth preservation strategies for our clients. For more information, feel free to contact us. Our monthly Investment Analysis Report requires a subscription fee of $40 a month. Current subscribers are allowed to freely distribute this report with proper attribution.